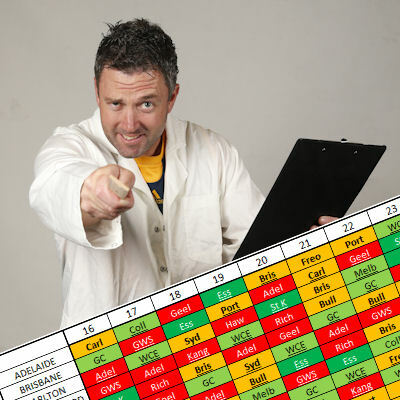 With just two rounds to go and the all important Preliminary Final this week… now is the time to nail the right trade heading into what is going to be the biggest day of your Fantasy life. Over the last 3 weeks, it has been the West Coast Eagles who are bleeding points, conceding 18 tons. This week, they travel to the land of the Giants and it will be their turn to cash in. Watch for players like Kelly to have a big one this week. North Melbourne and Port have given up 16 and 15 scores in triple figure in the last 3 weeks, ranking them at number 2 and 3 in this category. So hold on to those under-performing Dogs because at home this week, they should return the faith with a solid score. Avoid players who are playing Geelong, Richmond, St Kilda and Sydney this week as their numbers have been very restrictive in recent weeks. Geelong especially have clamped down the scoring of others in a big way. Treloar, Adams and Sidebottom face them this week and I personally, would avoid trading any of the these guy in for this week. But is it worth getting Dangerfield if you haven’t got him? So hold Dahl?? I was gonna switch him out for Hodge via Sicily DPP…. Your Easy Run graphic is missing Hawthorn. Don’t forget, Dogs are playing in Ballarat. Haven’t seen the exact numbers, but it’s possible for Melbourne to have an easier run despite only have two light greens. Imagine they’re both juuust above dark green status, while Hawks light green is well above it and their dark green only just slots in. Worth bringing Merrett back in given his run home? Or chase a Gibbs or Kelly? Hey guys. I’m looking at trading out Josh Thomas and upgrading him to either Wingard or Sidebottom. Who do you think would be best for remainder of year? Who should i trade in: Hurley or Hibberd? This makes no sense. Collingwood is one of the hardest teams to score on so why are they rated so easy?